The OLD Big Dead Sidebar: What The 'Fuk'? Right field is becoming an area of concern again for the Chicago Cubs once again. Sure, Kerry Wood is inching his way to another DL stint and Rich Hill is closer to Rick Ankiel than Rick Vaughn. But it's the slumping stick of Kosuke Fukudome that has the Cubs and their fans puzzled. Fukudome, who went 3-for-3 with a double and a dramatic game-tying home run off Eric Gagne, is hitting .171 with more strikeouts (14) than games played (11). It's a drastic turn in the wrong direction for the rookie All-Star, who was expected to give the Cubs a solid left-handed bat in a line-up full of right-handed thump. Fukudome has struggled in the top two spots of the order, hitting .191 in 99 at bats. On the other hand, he has been successful in the No. 5 slot, hitting .316 with a .427 on-base percentage. So what is it? Is K-Fuk slumping because the dog days are wearing on him? Is it because of the line-up (and sometimes position) movement? Is it because NL pitchers have figured him out? When Alfonso Soriano returns to the line-up, manager Lou Piniella has some major decisions to make. And none of them involve moving Soriano down in the line-up. 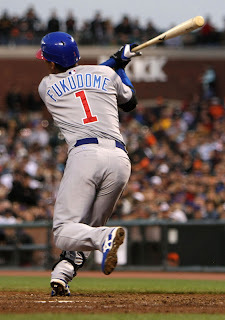 Will he move Fukudome back into the slot he's been most successful in or will he keep Jim Edmonds there because of his success in that slot in a Cubs uniform? Will Fuku bat two, behind Soriano and in front of Derek Lee? Will Lou drop The Dome to the No. 7 position? Will he lose playing time to Mike Fontenot, who has one more homer than Fukudome in 188 less at bats? You know what, I'll let the manager that earns upwards of $3 million per year make those decisions.